Context: Night fell on my day in bed while I finished this off – the fourth book in a day. Felt much better afterwards. Not only has Hamid got a good idea for a book here, he’s chosen the perfect vehicle for it. 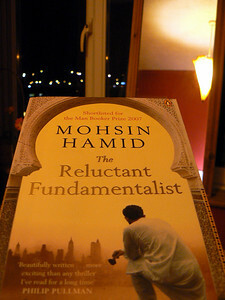 The novel is told entirely in monologue by the reluctant fundamentalist. It is told to a USAnian who wanders into a market in downtown Lahore. This nameless, faceless, voicless USAnian is a great character and the way Hamid uses him in the book is a superb compliment to the monologue. I read this in one sitting and greatly appreciated it all the way through. It’s a novel that deals with cultural, and therefore ideological, clashes and how these impact our psyches and shape how we are. I related a lot to the main character because I went through similar agonies of identity when I came back to the UK when I was 11 and attempted to fit in just as Changez does. Changez is a brilliant Princeton scholar who arrives in the UK from his native Pakistan aged 18. On graduating, he wins an exclusive position at a company which values businesses for sale. He’s gifted and wins the confidence and support of his boss early on. This projects him into an executive world of material wealth that he attempts to use to find an identity in. But the veneer wears thin through personal and one particular historic event which cause him to question what he’s really doing and who he really is. At the beginning and end of each chapter, the monologue is interrupted by returns to Lahore where the USAnian is increasingly uncomfortable in the world of the reluctant fundamentalist. I really like these parts which parodied the shoe on the other foot and questioned the involvement and influence of the US in the world. Can’t have too much of this in my opinion. The novel climaxes right at the end and is a cliff-hanger which I thought was a perfectly matching solution to the novel. Hamid communicates clearly what the issues are that he wants us to deal with. They are important and far-reaching and make this book a document of our own times that will be increasingly important in years to come. Excuse me, sir, but may I be of assistance? Given that you and I are now bound by a certain shared intimacy, I trust it is from the holder of your business cards. I read the book some years back and simply loved it. With many books cluttering the world about a post 9/11 era, this one really stood out and Hamid keeps you pegged to the book from start to finish. I vaguely recall having finished the book in one sitting too. yes… such a shame that it’s just been removed from the 2010 edition of the 1001 Books list… what on earth were they thinking. There are tons of books that are less worthy than this one. Thanks for your kind comment about my review. Glad you enjoyed it and the book!